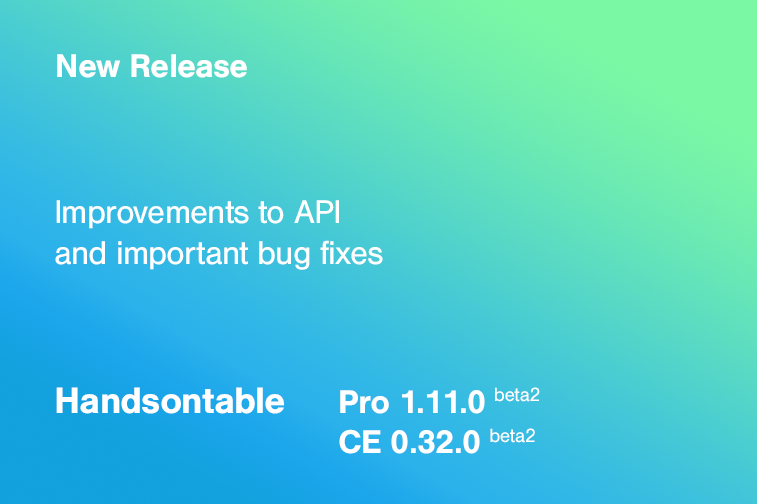 Today we have released Handsontable PRO 1.11.0-beta2 (Community Edition: 0.32.0-beta2). This version comes with one backward-incompatible change so make sure your code is adjusted before updating the spreadsheet. Changed the way in which custom cell types are being registered (#4254). As you already know from beta1 release, we have migrated from Traceur to Babel. That required from us to standarize the code, namely to stop using a Handsontable global variable. But that changed the way of adding custom editors, validators, renderers and their combinations like ‘cell types’. In this beta2 release we improve the public API to give developers an ability to register cell behaviors and types separately. We strongly recommend to use a registered alias in Handsontable settings to increase the code maintainability.